The operation was to drop mines in the Kattegat area of Denmark, the weather closed in and most of the crews returned home. Bell decided to drop down to see how low the clouds were, at 600 feet he came into the clear where he along with two other crews completed the operation. The Summary section of squadron ORB entries at times leave out the complete story of what occurred during that operation. The May night of 29/30th for the R.A.H. Bell crew is one of those times, it simply says " ...port inner engine damaged by flak ... " . The more detailed description of night was that while still over the defended area with what was described as extremely accurate flak, shrapnel knocked out the port inner engine which was responsible for running the hydraulic pump for the flaps, bomb doors and undercarriage. Bell understandably wanted to clear the target area quickly but the drag on the aircraft by the bomb doors being open was slowing this escape considerably. Getting doors closed to gain speed and height was now paramount. The doors could be closed by hand but required a lot of effort; it was not the amount of effort that was in question it was the amount of time it would take to hand crank the doors closed again that was seen as the problem. The Flight Engineer Sgt. Taylor knew it was too hazardous to be staying around flying at their present speed. An ack-ack shell fragment had already with in this time exploded and burst the Perspex window near Bell, Bell felt a pain in his arm and thought he was wounded. So Taylor rather then hand pump the doors closed simply took the emergency axe and severed the hydraulic lines. The doors closed within seconds and Bell headed the fastest way out of the target area. Landing at RAF Swanton he found that the pain was there but not signs of actual injury or blood so he and the crew laughed off his injury. When R.A.H. Bell arrived as 419 back in January of 1943 his Navigator was F/S W.L. White who completed 25 sorties with the crew, F/S R.O. Williston completed 26 sorties, Sgt. Arseneau 28 sorties, P/O William B. Taylor 28 sorties, Sgt. J.F. Graham 28 sorties and F/S G.E.Aitken also 28 sorties with the crew. They were at this time one of the most senior crews with the squadron. Pilots were not always given their own aircraft right from the start, some flew many different Halifax before one became "theirs". For Sgt. Bell the opposite was true, his first operation was on Halifax BB283 it he and his crew continued to fly it on operations until B283 was lost on March 28th. with another crew on board. Then DT794 continuously for six sorties before it too was lost while on a sortie with another crew on May 5th. Throughout the documents and sources Sgt. Bell later F/O Bell was listed and mentioned as R.A.H. Bell. The "R" was not found on other sources such as the CWGC lists and Veterans Affairs in Ottawa. What is found in use was Angus Hugh Bell. His nickname was "Bob' so the "R" should be Robert but it does not appear on the documents shown in the two sources mentioned. The morning of July 4th at 0050 hours was described as dark with the visibility being poor as VR-Y crossed the coast into the enemy held lands beyond. JD159 was already off course heading North of the intended path. Within ten minutes searchlights had found them, fighter flares began to appear and the Monica Radar started piping. 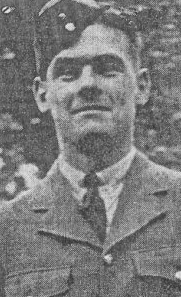 F/S Aitken the rear gunner responding to the Monica warning of aircraft coming in from behind could not see the expected enemy fighter as he searched the dark skies looking for some dark speck that could be the enemy. He requested Bell to dive then climb, bank port and starboard hoping to see the attacker. Again nothing was seen by the rear gunner. Monica began piping more rapidly, Aitken again called for the manoeuvering to search the skies for the suspected fighter. Just as at that time an ME109 drove up from port quarter under and it fired a medium burst at the Halifax. The enemy fighter's guns made hits on the forward section of the fuselage damaging the flap accumulator in the hydraulic system. The fighter broke off the attack and was seen against the horizon which gave Aitken a chance to return fire at their assailant. The ME109 turned and came in for a second pass, the fire from its guns hitting the port engine setting it on fire. The crew then found that both Taylor and 2nd. Pilot Anderson were wounded by this pass. A second fighter then made a pass firing a long burst that hit the starboard outer tank setting it on fire. Aitken had tried to return fire on the third pass of the first ME109 and again as the second attacker made his pass. On all these tries the guns that had worked so well a few minutes earlier failed to operate. The pilot P/O Bell put the Halifax through the most violet evasive maneuvers that the aircraft was now capable of and the enemy fighters stayed with them. Bell called for "Prepare to bail" and then within seconds "Bailout". 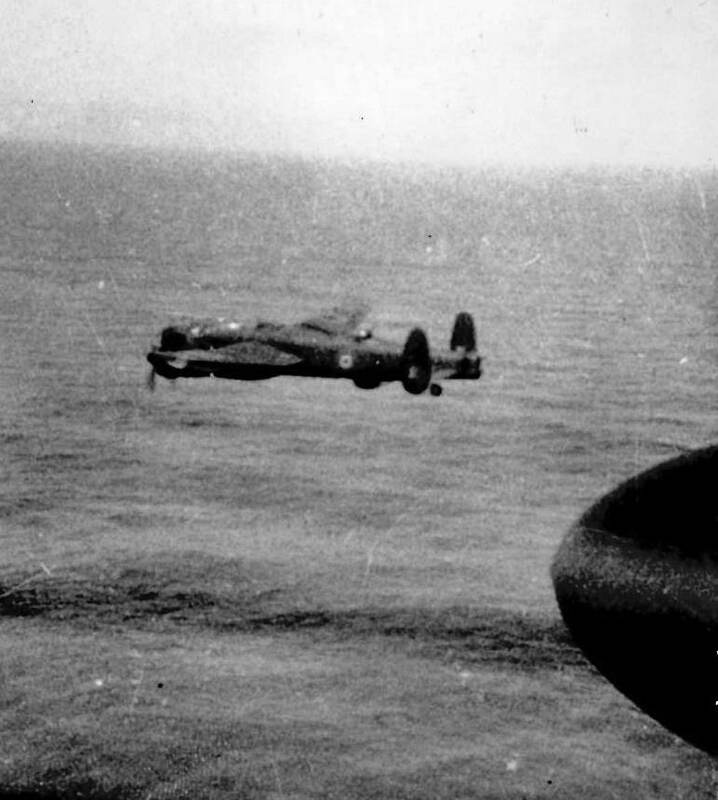 Left with only the two wounded on board P/O Bell tried to make a landing. All three were lost in the attempt.